Are you into woodworking but get frustrated when it comes to making curved or other odd shaped cuts? Maybe it’s time for you to upgrade to the best jigsaw model. Having the right jigsaw enables you to make all the difficult cuts that table saws and other types of saws just don’t do well. They are few tools that are handier to have when it comes to woodworking and making specialty cuts. That is why we have taken the time to write this article. We will review some of the top jigsaw models and also tell you what to what to focus on when buying a new jigsaw for yourself. By the time you are finished reading you will know exactly how to go about purchasing a jigsaw that meets your needs and your budget perfectly. Here is a brief preview of the jig saws that we will review in much more detail a little later on in this article. Which Model Jigsaw Do We Like Best? When you start looking for a new jigsaw model you will most likely be amazed at the variation in pricing. They are some real bargains to be had and there are some more expensive jigsaws loaded with handy features. It is up to you to decide how much you will use your jigsaw and in turn how much you want to spend in correlation to that use. As a general rule the more a jigsaw costs the better a model it is but if you look around there are some great deals to be had in the tool marketplace on them too. You will have to pay close attention to the amp draw on any jigsaw that you buy. This is important to know because the more amps your jigsaw draws the more powerful it will tend to be and the cooler it will run. A jigsaw motor that runs cooler will most likely last longer because heat can do a lot of damage to a power tool over time. When you are shopping for a new jigsaw pay close attention to the blade strokes per minute it’s capable of generating. This is especially important if you use your jigsaw for cutting through hardwoods or other tough materials. The more blade strokes per minute a jigsaw has the easier it will cut through tougher materials. Look for a model that will go up to at least 3000 SPM. A variable speed function is also a nice feature to have on any jigsaw that you purchase. This will allow you to rapidly cut through materials when detailed cuts are not required and it will also allow you to slow the blade down when making more precise or rounded cuts. Virtually no one can own a power tool like a jigsaw and not subject it to some abuse from time to time. Accidentally dropping your jigsaw, banging it on other objects and having it fall over are all common occurrences that happen when using a jigsaw. That is why you want any jigsaw that you buy to made out of tough materials. The best jigsaws have materials such as metal alloys, rigid polymer plastics and rubber pads in the right places to help protect them during storage and when in use. Be sure to note how any jigsaw that you are thinking about purchasing is constructed. You want to purchase a jigsaw model that is very easy to use too. When you are shopping for a new one look for such features as variable speed buttons that are located where it does not take much effort to activate them and on/off switches that work simply. Other features such as a blade speed lock and laser guidance are nice to have also. If you will only be using your jigsaw for a short amount of time just occasionally you really don’t have to be concerned with how comfortable it is to use. That becomes a whole other ballgame if you will be using your jigsaw on a regular basis. You will want a jigsaw that has a good ergonomic design and is easy to hold for longer periods of time. Look for such things as rubber grips, special handle contours and other features that will enable you to work your jigsaw for extended use. This is a very important consideration if you need to use your jigsaw for long periods of time. Not all jigsaws are created equal when it comes to blade versatility. Some jigsaw blades operate 100% of the time in a fixed position while others can be set at different blade angles or in a scrolling position too. The latter will be very important if you do woodworking that requires much intricate cutting. So make sure you are aware if any jigsaw you are looking to buy has only a fixed blade or one that can be positioned in multiple ways. Any woodworking area or toll shop is generally considered a harsh working environment for power﻿ tools. These areas tend to be hot and dust and neither of these conditions promotes long power tool life. Not to mention that just the normal conditions that are placed on jigsaws during use can be tough on them. That is why you need a good warranty on any jigsaw purchase that you make. Warranties will usually only cover poor workmanship or material defects but some are all inclusive. Try to get the longest and most comprehensive warranty you can find when making your jigsaw purchase. This is especially true if you spent a lot of money on your jigsaw purchase. DEWALT is a big name when it comes to making quality power tools and this jigsaw product is no exception. It allows for a lot of flexibility when using and it can be used for many different woodworking and other sawing tasks. It features a powerful 6.5 amp motor that runs cool to help extend this products motor life. This jigsaw also includes a variable speed function that will allow you to use this tool at anywhere from 500 – 3100 strokes per minute. This jigsaw is very simple to operate too. All the buttons and switches are nicely located so they can be reached as you work with it. It is ergonomically designed, nicely counterbalanced and has rubber grips in all the right places too. It is a very safe jigsaw to use to thanks to the many guards that are strategically placed on it. DEWALT has included a nice hard case with this purchase and also backs it up with a very good 3-year limited warranty. When you see the price on this jigsaw and then find out all that it does you will find it hard to believe. It definitely has the most bang for the buck of all the jigsaws on our top review list. Kudos to WEN for making an affordable power tool that has many features that are usually only found on much more expensive jigsaw models. The appeal of this jigsaw starts with its nicely powered 6 amp motor that also helps promote long motor life. With its variable speed switch you can use it anywhere between 800 – 3000 strokes per minute. This jigsaw is very lightweight and easy to handle too. It weighs just over 4 pounds and has a design that makes all the settings and switches easy to operate. It has 4 different positions you can angle the blade to for cutting also. There is no included case but that is not a deal breaker at this low price point. It does come with a very decent 2-year warranty. It is an excellent jigsaw model for any homeowner or the occasional DIY woodworker. It’s hard to beat Bosch products when it comes to great working power tools and this jigsaw is a perfect example of why that is true. This jigsaw model would be an excellent addition to any homeowner’s or working professional’s tool collection. This jigsaw has a very powerful 7.0 amp motor. That means you are virtually assured that this products motor will stay powerful throughout its long working life. It also has a variable speed function that will let you operate it at anywhere from 500 – 3100 SPM. That is enough power to even cut through 4” pieces of wood. Not only does it have a variable speed switch but you can also set the maximum SPM you will allow it to work at when making difficult cuts. This is a sturdy and easy to use jigsaw model also. It is build using tough polymer plastics and rigid metal alloys. It has a very nice top-handle design which features rubber grip material throughout the handle. It comes with a sturdy carrying case too but is disappointedly only backed up by a one year warranty. Portable-Cable has been making reliable power tools for many decades now. This model jigsaw is powerful and has many nice features built into it. It’s a jigsaw that can be used for both home and professional use too. This jigsaw model is nicely powered by its 6.0 amp motor. It also has a variable speed button that is uniquely located in its trigger. You can set the variable speed anywhere from 0 – 3000 SPM. That gives you a lot of versatility when making cuts with this power tool. You don’t have to worry about this jigsaw getting ruined easily because it is built very sturdy. There are both lightweight metal alloys and rigid polymer plastics used in its construction. You also do not need to use any tools in order to change the blade on it. This model does not come with a hard case but Porter-Cable makes up for that by backing it up with a full 3-year warranty. There are few more easily recognizable names when it comes to power tools than Black & Decker. 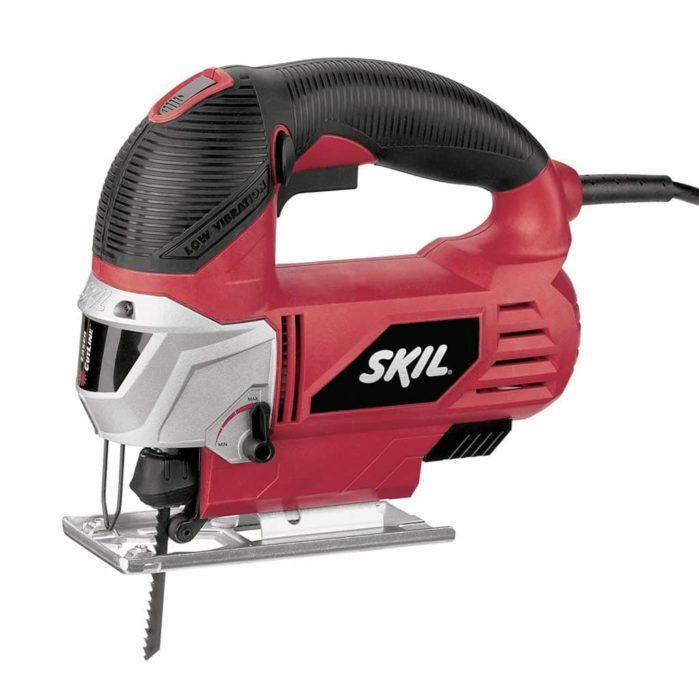 It is a company that is known for making good quality power tools that are affordable too. This jigsaw model from them certainly fits into that mold. 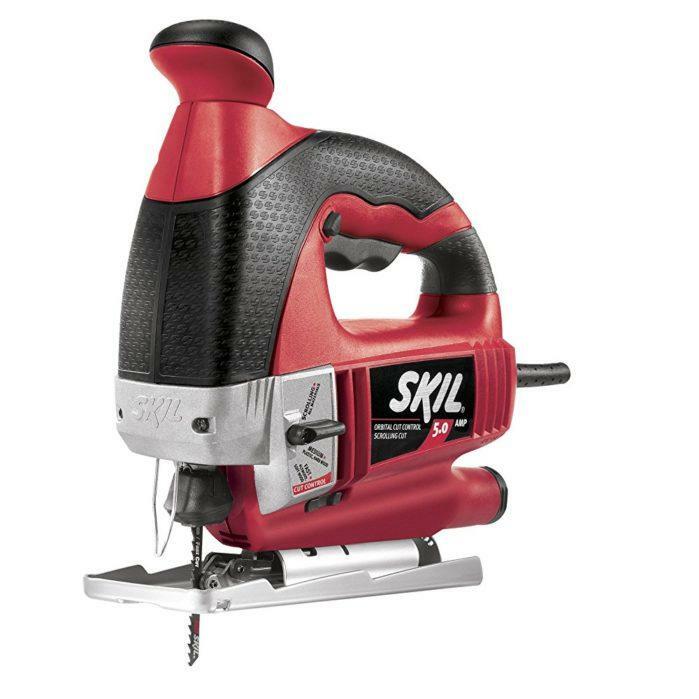 It has a nice sized 5.0 amp motor that will allow any user to cut through wood easily that is less than 2” thick. This jigsaw also comes with a variable speed feature that will allow you to use up to 3100 SPM’s when working with it. This affordable jigsaw model has some other things to like about it too. You can nicely angle its blade up to 45 degrees and you can also set the blade to one of four different orbital settings too. It’s a very ergonomically designed jigsaw that is also very simple and straightforward to operate. There is no case included with this product but it does come with one blade so you can use it right away. Black & Decker backs this jigsaw up with a good 2-year warranty. It would be a great addition to any homeowner’s power tool collection but it’s not recommended for heavy duty professional use. As you can tell by their consumer ratings there is not a bad jigsaw model on our top review list. Any one of them will make a great addition to your tool collection. There was one however that stood out among the rest in our opinion. That was the Bosch JS470E 120-Volt Top-Handle Jigsaw. We felt it had many features that set it apart from the other jigsaws on our best model review list. It had the highest powered motor of any model we reviewed and had as good as or better SPM than any of those models too. It featured unique anti-vibration technology and used many lightweight metal alloys in its construction. We really liked its max SPM setting switch as well. There is just much to like about this model jigsaw from Bosch. That is why we feel anyone that is looking to purchase a new jigsaw should take a serious look at it before making their final jigsaw purchase. It really is the best jigsaw product on our top review list. 5 Of The Best Dowel Jigs For Every Woodworker!